Remounting diamonds can breathe new life into jewellery that over the years has become broken and worn. 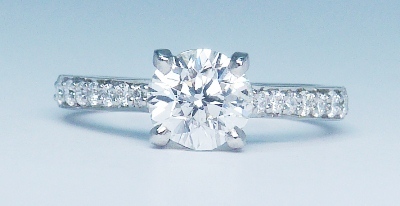 We have taken stunning diamonds from older jewellery and had them set in to new ring mounts and shanks. We have updated the look of these stones by having them set into classic and modern designs. Each diamond has been selected for its quality and once reset you have the peace of mind of having a beautiful diamond, which will be secure in its new mount, yet cost you less. Jewellery has seasons and eras, just like the fashion industry. There are designs that are considered “classic” and then there are those that, twenty years later, look seriously dated and gaudy. Remounting stones is a wonderful way to give gemstones a new, fashionable life. All Diamonds have been independently graded and come with their own grading report and insurance valuation.